196 pages | 50 B/W Illus. 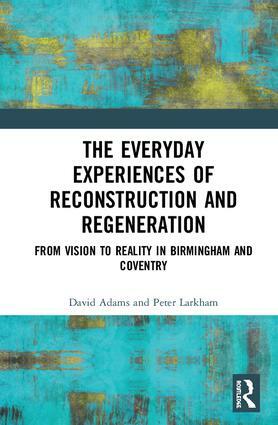 Set within a wider British and international context of post-war reconstruction, The Everyday Experiences of Reconstruction and Regeneration focuses on such debates and experiences in Birmingham and Coventry as they recovered from Second World War bombings and post-war industrial collapse. Including numerous images, Adams and Larkham explore the initial development of the post-Second World War reconstruction projects, which so substantially changed the face of the cities and provided radical new identities. Exploring these cities throughout the post-war period brings into sharp focus the duality of contemporary approaches to regeneration, which often criticise mid-twentieth century ’poorly-conceived’ planning and architectural projects for producing inhuman and unsympathetic schemes, while proposing exactly the type of large-scale regeneration that may potentially create similar issues in the future. This book would be beneficial for academics and students of planning and urban design, particularly those with an interest in post-catastrophe or large-scale reconstruction projects within cities. Acknowledgements. 1. The Process and Product of Reconstruction 2. Designing and Delivering Reconstruction 3. Disaster Opportunity: Replanning Coventry and Birmingham 4. Memories of Rebuilding 5. New Model Cities 6. Recollections of Urban Renaissance 7. Moving from Vision to Reality References. David Adams is a planner and geographer, and his current research focuses on questions of representation and experience of the urban realm. His research interests cut across the fields of urban theory, design and form. He is particularly interested in how urban townscapes are shaped and the (continued) impacts of post-Second World War reconstruction planning in Britain, with particular regard to data infrastructures, to encourage public participation in planning and development decisions. Elsewhere, his recent and ongoing projects include studies of ‘guerrilla’ gardening in its potential for planning discourses; and the reconfiguration of ‘planned’ cities through everyday practice. Peter Larkham has a variety of research interests that cover different aspects of urban form. He has a long-standing interest in conservation, and in recent years has been focussing on the replanning and reconstruction of British towns after the Second World War. He has published numerous papers in his field and built a worldwide reputation. Peter has published over 65 refereed journal papers, written and edited several books and presented numerous papers at conferences in the UK and worldwide. His recent book is The Blitz and its Legacy (edited with Mark Clapson, in 2013) and three more books on post-war reconstruction and on urban form published in 2013–2014.